Often described as Chanel No. 5 with violets, Le Dix ("The 10"), with its nose-tickling aldehydic sparkle and haunting violet note, holds its head up high among vintage perfumes, like a handsome older woman in a sturdy 1940s suit, hat, and full makeup standing in a sea of Forever 21-clad teenagers. She has to be proud; everyone is telling her she smells "powdery," "old," and "soapy." Gaia from The Non-Blonde reminds us that uber-feminine Le Dix came out in the same decade as the iconic leather chypres Bandit (1944) and Miss Dior (1947). Its initial impression of softness and conventional femininity is bound up with a perfume note that has perhaps always signified nostalgia and melancholy: violet. As I wear Le Dix and let it settle on me, I understand why this is the first vintage violet scent I truly appreciate. It's faithful to the melancholy connotations of violet but adds gourmand richness to round it out and a spicy/woody backbone to give it some edge. Le Dix's comforting impression of velvety violet and vanilla lingers on my skin even as I write this. But Le Dix is not just a stuffy, smiling, powdery grandma who smells like a spiced Choward's* * candy. 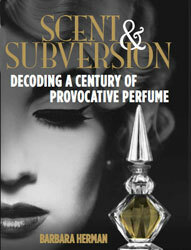 Like her 1940s perfume sisters, Le Dix has a past and some edge if you sit down with her long enough. In spite of its much-maligned note violet, which "radiates from the top note to the fond" as one writer put it, Le Dix takes this melancholy note and turns it into a stalwart, if conventionally feminine dame, like one of Vivien Leigh's characters or the troubled beauty herself. I'm not sure if I could wear this one, but I certainly can admire it. * This amazing quote from Mark Twain comes from the beautiful poetry and perfume blog Memory & Desire. Specifically from her post on the violet note. * * You can get Choward's violet candies here. You can read some fun facts about violet here (violet blossoms are high in vitamin C; violets contain ionones which disable your ability to smell it unless you stop and return later; and it was a favorite note in the 19th century, etc.). And here's Edith Piaf, singing what I imagine is Le Dix's favorite song: Je Ne Regrette Rien. 1960 to 1970 is classic time of fashion and everything including perfume! love this feel! I discovered this fragrance in a discount perfume store in Manhattan "many moons" ago. Given that I wore it frequently in high school it did not evoke "soapy", "powdery" or "old womanly" to me at all! Rather, the most predominant note for me was violet. I have always been intrigued by the scent of violets and in the early 80s there were no current scents (to my knowledge) that allowed violet to be at the forefront. Not sure why the scent of violet is considered nostalgic or melancholic for in my mind it is as fresh as a spring day. I do firmly think Edith Piaf really does deserve much more than a fragrance's dedication, indeed! That recording (amateur, then gorgeous) tape excerpted from YouTube means something higher than any scent or glamorous perfume mentioned above. When an artist has deeply suffered and given as the whole existence as Piaf did, just reducing her identity to a "reference product" seems to me fairly insulting, inappropriate, at least. Read about Edith Piaf's life and tell me about. Gio, I'm not sure how including "Je Ne Regrette Rien" into a review of a beautiful, classic French perfume diminishes Edith Piaf. An artist created Le Dix and included a melancholy violet note whose connotations made me think of her. Like Piaf, Le Dix is feminine, vulnerable and yet fierce. I received this wonderful scent as a gift from a friend who purchased it in Paris while on a business trip. I was instantly in love with it and have cherished it ever since. Unfortunately the parent company decided to discontinue manufacture some time ago and it is now getting very difficult to find. Even the online discontinued perfume sellers seem unable to provide it any longer. It's a tragedy and shame that not only will I no longer be able to enjoy this exquisite scent but those who have not yet been introduced to it will never know the pleasure one experiences when putting it on for the first time. Trust, me Patricia, I feel your pain, but a quick visit to eBay showed me there's a lot of good-looking Le Dix perfume to be had there. Check it out! If the color looks good, it has a box, the seller has a decent reputation, and the price is right...go for it!